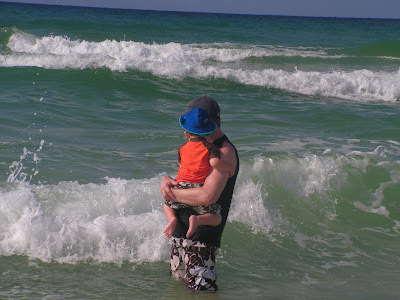 This past week we headed to Destin, Florida for our family vacation. David's parents joined us and we were so thankful for their company and help throughout the trip. We also enjoyed many games of cards, reading books,eating bearclaws,chocolate eclairs, and Kay's coffee ice cream pie! 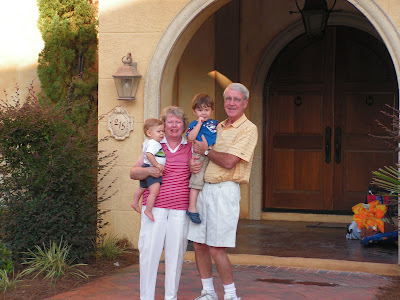 Below are David's parents and the kids in front of the house where we stayed for the week. We were very pleased with the weather during our stay. It called for thunder showers every day but thankfully we had pretty days after brief morning showers. We also were able to enjoy some beautiful sunsets! 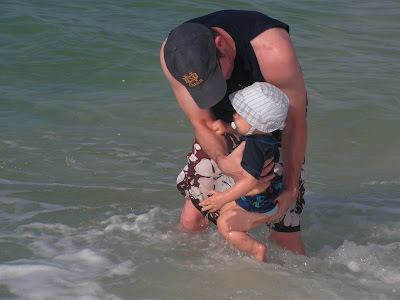 Below is Pops trying to warm Asher up to the ocean. They dug a hole in the sand and were waiting for a wave to come and fill it up. They had to wait awhile since Asher would not budge any closer to the water. This was Asher's second trip to the beach but his first time in the ocean! We were so excited for him. He wouldn't go in by himself but did allow us to take him out to the higher waves. Asher had not been sleeping well prior to our vacation (and not so great during) but seemed to enjoy his own king size bed, especially on this occasion. 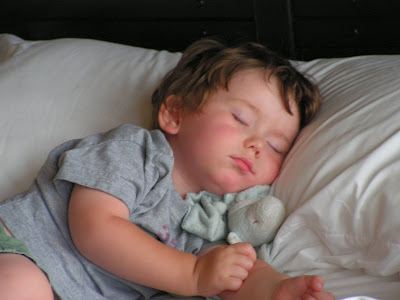 He took over a four hour nap and we could NOT get him to wake up despite multiple attempts to be "loud" in his room. I guess the ocean wore him out! We had precious family time throughout the week. 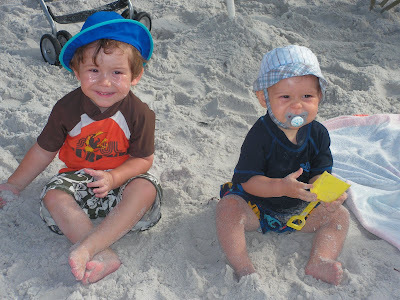 Asher and Jonas really enjoyed each other and practiced "sharing" their beach toys. This was one of only a few times that the two were actually sitting still next to each other. Notice they both are wearing hats that are really too small for their heads. 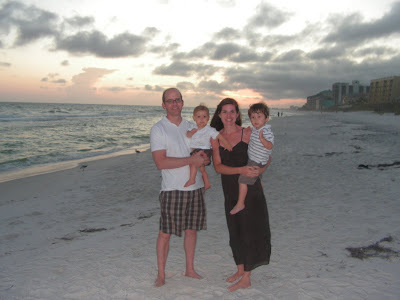 This was our first vacation for all four of us and Jonas' first trip to the beach. He loved every part of the trip (except for his nap times). This little boy loved the water and if he had his way, he would have preferred to go in by himself. 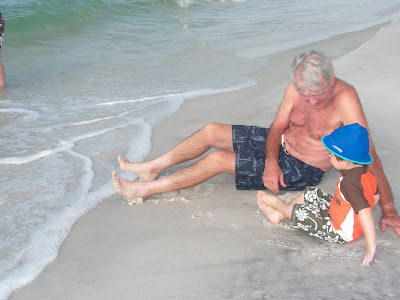 He would giggle with delight when a wave would crash on us. And of course he also enjoyed splashing in the pool. Jonas conquered the beach. He would play in the sand and then would crawl great lengths all over the beach (thankfully not into the ocean). 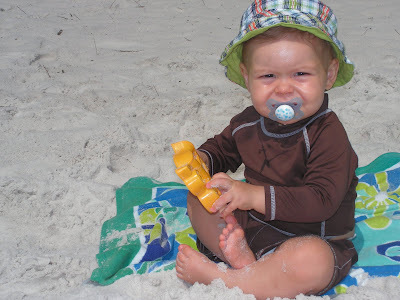 We kept a pacifier in his mouth to keep him from eating the sand. We actually only lost his pacifier once in the ocean but it managed to wash up on the shore and another family found it for us. 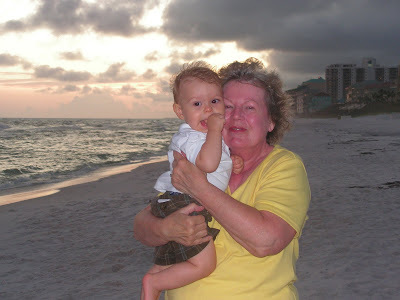 Jonas enjoyed getting his picture taken with all of us on the beach at sunset. However, Asher did not. He wanted to play in the sand instead. So, this is why we have a precious picture of Kay and Jonas but not one with Asher. Oh well! 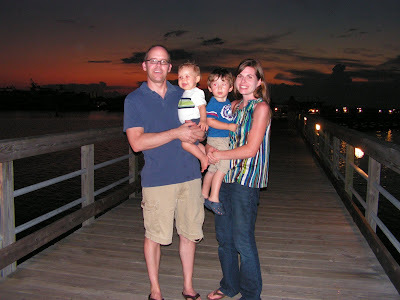 We went to dinner two nights at the Villages of Bay Wharf in Sandestin. It had a really fun playground for Asher to enjoy and one night we were able to watch a beautiful sunset over the docks. This was our last night and a great ending to a much needed vacation!